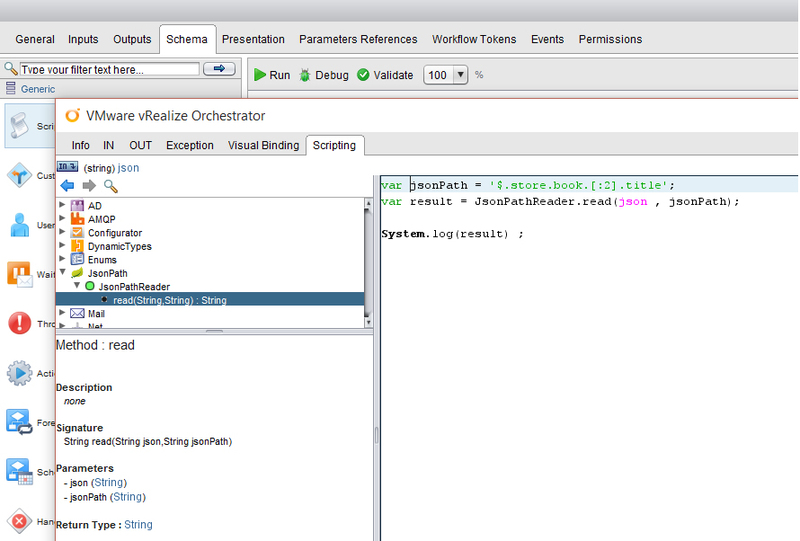 vRealize Orchestrator already ships with a lot of plug-ins for orchestrating all kind of external services. If there is no plug-in available, the preferred way is to connect to a REST web service. This is all very nice and convenient, but in doing so, we encounter the same issues everyone else does with REST. For example, parsing through all the response data we receive from the web service. Nowadays, this data is mostly typed in json. Json is very clean and readable, however working with json data can sometimes be very exhausting – especially as Orchestrator only comes with limited support for parsing JSON. Luckily there is a technology called JSONPath, which works in a very similar way to XPath. JSONPath helps to explicitly express the value we are interested in, from a JSON document. Now we have implmented a plugin that encapsulates the jsonPath API for use in Orchestrator (we use the most common java implementation of jsonPath: https://github.com/jayway/JsonPath). would result in „Sayings of the Century“, because it is the title of the first book of the store. To install the plugin, you always need to login to the vRO control center, then go to „Manage plugins“ and upload the plugin file which you can find HERE.